In my quest to declutter my house, not to waste groceries and all my list planning came this random recipe for a veggie soup. Pretty much, was trying to empty out some of my cupboard, use up the rest of some veggies and make a hearty soup that would give us some lunch leftovers. Plus, it let me use my crock pot and allowed for my husband and I to eat at what time worked for us since we were both busy that night. 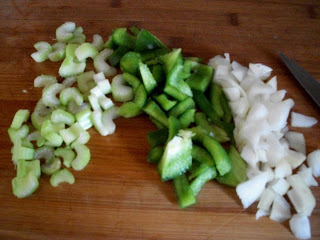 First, I chopped up the celery, green pepper and onion. 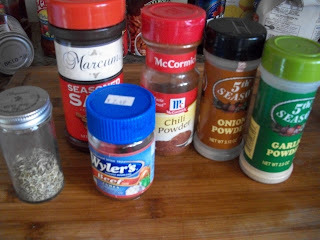 Then I threw in the seasons and 1 beef bouillion cube. Yum, all of those seasonings. 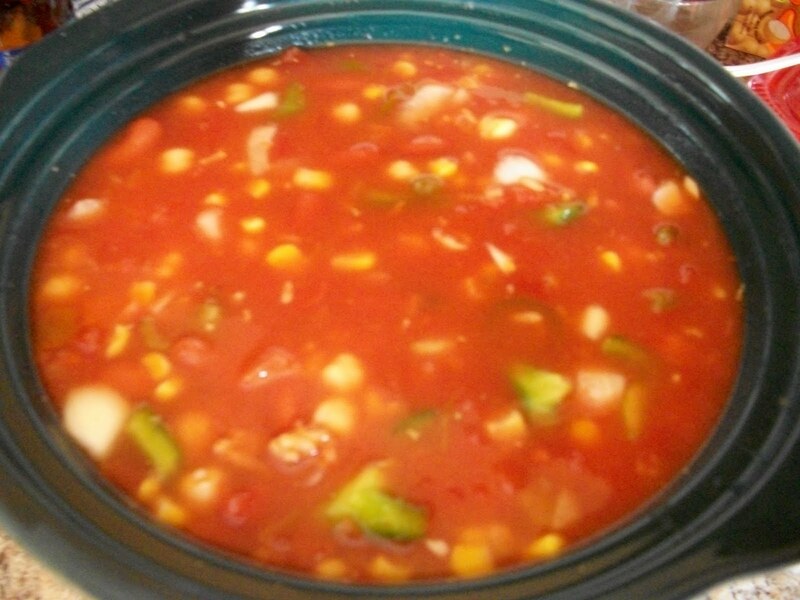 Then I threw in the beer, jalapenos, salsa, diced tomatoes, corn, beans, leftover rice and everything else. It was definitely a lot juicer than I thought it was going to be. I was slightly worried it would be too chunky. 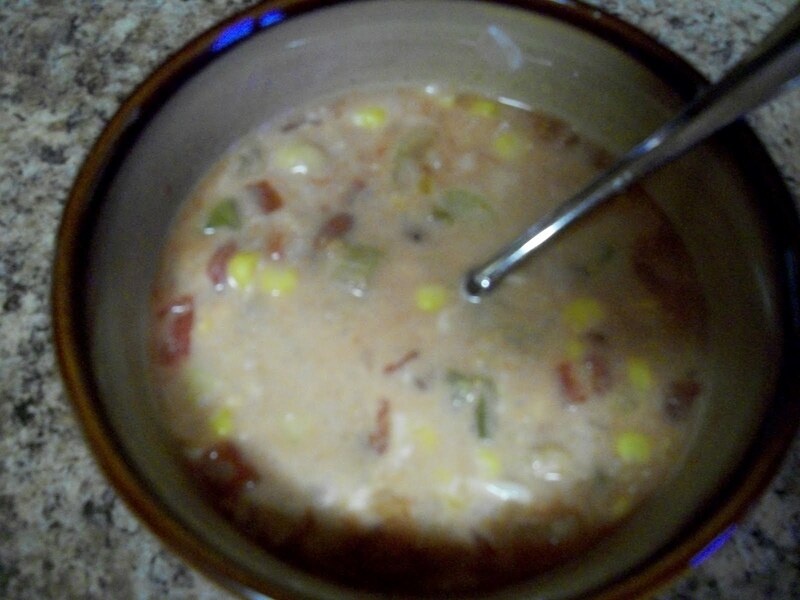 I was looking through my Rachael Ray 30 Minute Meals Cookbook to get some inspirations the other day when I found a yummy cornbreadish recipe that I thought would go great with a chili type of soup. 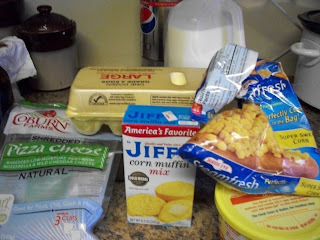 Plus, my husband is a huge fan of cornbread and I am indifferent and we had a box mix taking up space. 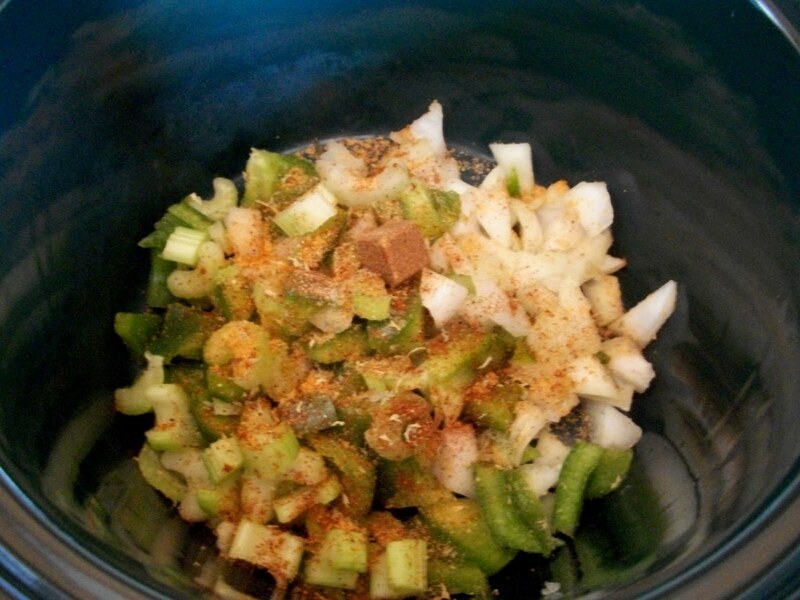 Enter this recipe. Above is a photo of all the ingredients I used. 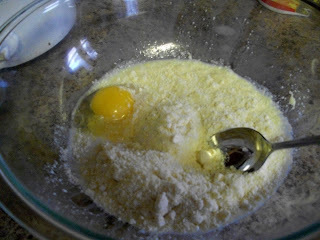 Following directions on the corn muffin box, I dumped the mix and an egg into the bowl. Then I added the milk that the box recipe called for and dumped in the corn. I started off with the recommend amount and then added more cuz I thought it could use some. Then I added the cheese. 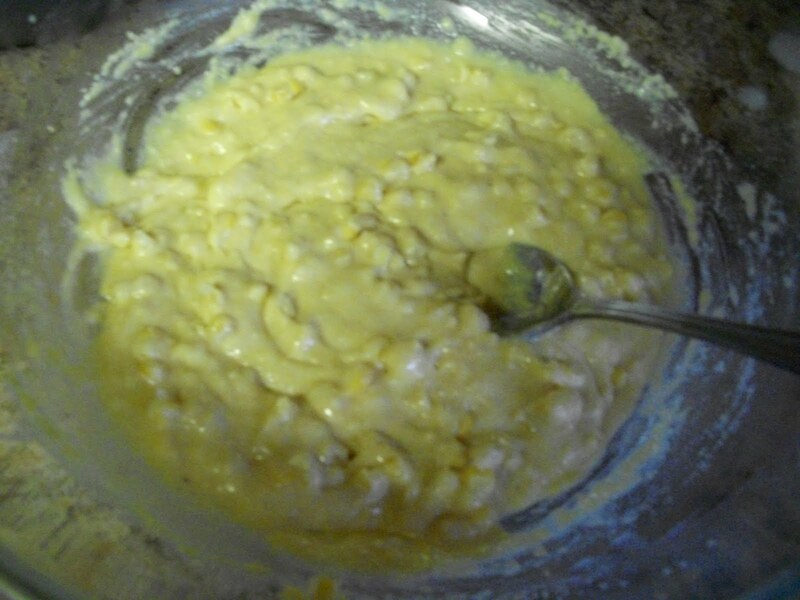 Next time, I would probably add more cheese because I love it so much. But I didn't want to go too overboard and make it weird. 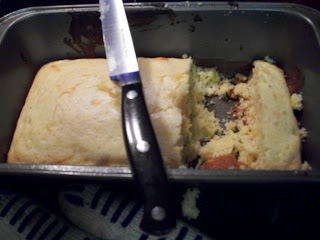 Then, I dumped it into a greased pan and let it bake for about 20 minutes. I followed the heating instructions from the box I used. I checked it at about 15, 18 and 20 minutes and it was golden brown at 20. 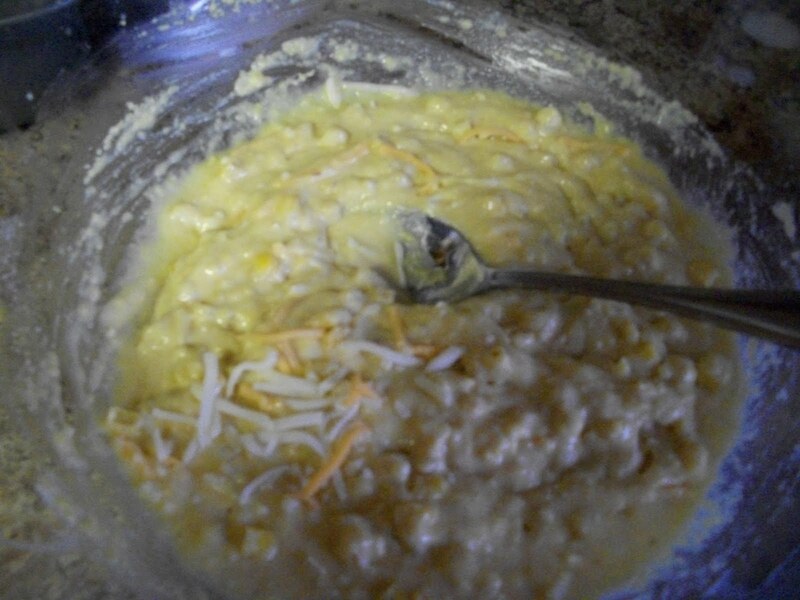 Here is a finished product of my bowl of soup, mixed with sour cream and shredded cheese. And my husband got into the pan before I could take a photo of the bread! The bread was so so to me but then again, I am not a fan of it to begin with. My husband loved it. What is your favorite empty the cupboard meal?